We have just uploaded the 66th episode of the Alien vs. Predator Galaxy Podcast (right-click and save as to download)! 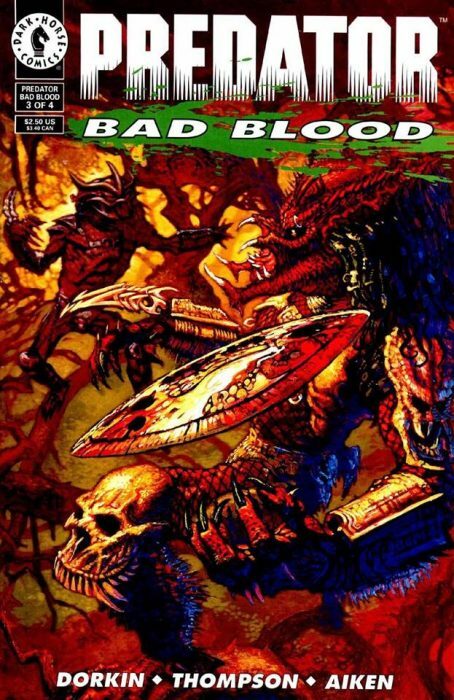 Our latest episode sees regular hosts Corporal Hicks, RidgeTop and Xenomorphine travel back in time to the early 1990s to take a look at the comic series Predator: Bad Blood! Amongst plenty more we talk about the comic series, Predator and human team-ups, the Bad Blood concept and the concept of Predators who don’t follow the same codes of conduct as the majority. We recorded this episode prior to The Predator teaser trailer being released so that will actually be our next episode. What did you think of our latest episode? Be sure to let us know down below! You can also listen to any of our previous episodes in the Podcast section under the News tab on the main menu. The Alien vs. Predator Galaxy Podcast is also available via iTunes, PodBean, GooglePlay and Stitcher. Nice one! Haven't read that particular one in years, but yeah I do remember the art being a bit all over the place. "Busy" would be an apt descriptor. Minor note: there were also Bad Bloods in the Predator: Concrete Jungle game, though I can't particularly remember why they were there. I remember thinking the Predator fights looked great, but I still couldn’t actually tell what was happening. Can’t wait to give this a listen! Great topic! I love the Bad Blood concept, one of the many things that builds on how different Predators can be as individuals compared to other movie creatures. Love the comic itself too, even if the art style isn't my favorite. Minor note: there were also Bad Bloods in the Predator: Concrete Jungle game, though I can't particularly remember why they were there. They were members of Scarface's clan who were captured, altered, and brainwashed by the main villain. Another solid podcast on one of my favorite Predator stories. Personally I loved the artwork and felt like every panel had so much movement going on. Nothing is static with Thompson’s art and it requires you to take in every detail. I’m glad Mandy Graves is now a recurring character along with my boy Enoch in “Hunters” and hopefully they both return for the sequel. This is one of my favorite Predator comics. Be sure to also read the "prequel" which explains what happened to the paintballers.